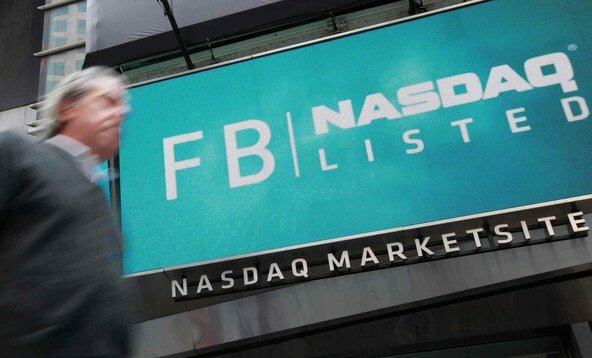 Brendan Mcdermid/Reuters Facebook on the NASDAQ Marketsite. Just days before Facebook went public, some big investors got nervous about the social network. After publicly warning about challenges in mobile advertising, Facebook executives held conference calls to update their banks’ analysts on the business. Armed with the new information, analysts at Morgan Stanley and other firms started reaching out to their clients to dial back expectations for the Internet company. One prospective investor was told that second-quarter revenue could be 5 percent lower than the bank’s earlier estimates. Another analyst warned that revenue could be light for the next two years. As investors tried to digest the developments, Morgan Stanley was busy setting the price and the size of the I.P.O. While some big institutions chose not to buy the stock, others placed large orders. And retail investors, who weren’t necessarily privy to the same information, continued to clamor for shares. John Tlumacki/Boston GlobeWilliam Galvin, the Massachusetts secretary of state. In the end, Morgan Stanley bankers decided they had enough demand and interest for Facebook to justify an offering price of $38 a share. When Facebook went public on May 18, shares of the social networking company barely budged — and they have been falling every since. On Tuesday, the stock closed at $31, more than 18 percent below its offering price. Posted on May 22, 2012, in #social media and tagged Facebook concerns, information analysts, prospective investor, retail investors, social network, start ups. Bookmark the permalink. 1 Comment.